Harry Brooks in his debut race for Bray in the junior race. 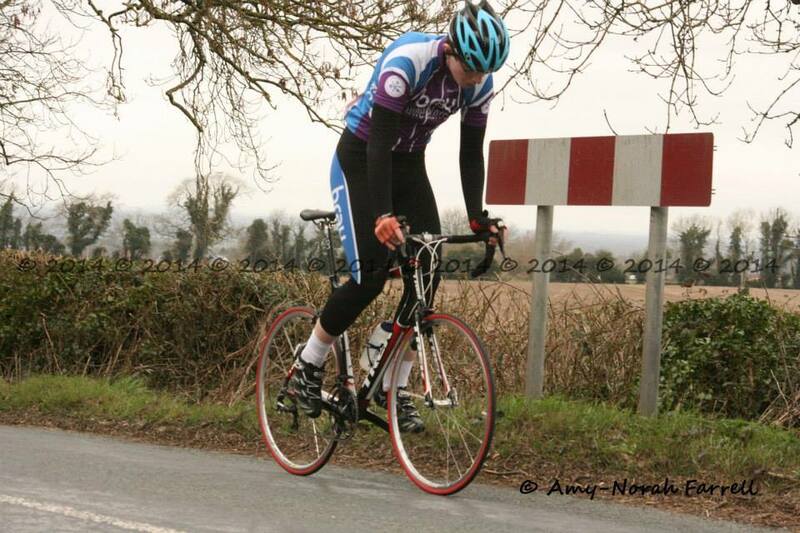 The new race season continued this week with the Ras Naomh Finian in Clonard on Saturday. Ed O’Brien took part in the A1/A2 race after his late season upgrade to A2 last year. Others took part in the A3 race. Also at the weekend Sundays race was in Newbridge where a large contingent of Bray riders took part. Harry Brooks who is fist year junior took part in his first A3 race. The beginners spins ably led by Eamonn Kearns continued on Saturday from the townhall in Bray with a large turnout. Several of the beginners are in training for the Skoda Cycle series – in aid of Bray Cancer Support, which takes place in County Wicklow on Saturday April 12th. Ger Ivory led the track training at Sundrive on Saturday where several Bray riders took part in a tough training session in preparation for the season. The youth spin on Sunday was at Ballinastoe in Roundwood with some riders doing an off-road spin and others doing a road spin in the area. There was a good turnout for this event in the improving weather. The next youth spin will be on the track in Sundrive on Sunday the 23rd, and the big cycling news of the weekend was that the government has approved Cycling Irelands proposal for an indoor velodrome at Abbotstown in County Dublin and this will now go the planning stages. Tuesday night training continues this Tuesday night at 7.30 from Kilmac. We wish to remind everyone that there are now weekend spins for all levels from absolute beginners up to racing level. On Saturdays we have the beginners spins, which cover 50km at an easy pace. Also on Saturdays the leisure group leave Kilmac at 9.45 for an easy 22-25kph spin, and the 10 am 26-28kph long spin will both leave as always from Kilmac. There is no problem with riders joining these groups where they wish along the route. Also on Saturdays there are two race training groups which leave at 9am and at 9.30 and everyone is asked to start these spins from Kilmac and not to join in along the route. On Sundays there are just the race training spins at 9.30 and the leisure spins at 10am. New members are always welcome.